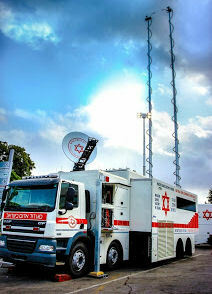 MDA officially unveiled its new pride and joy at the 2013 International Magen David Adom Conference (IMDAC) – the most advanced Command Centre Vehicle in the world. Designed by and for MDA, the Vehicle was built on the chassis of a Dutch truck, constructed in England and is equipped with Israel’s most advanced technological systems. systems crash, the vehicle contains special cameras, the ability to control MDA dispatch centres from afar, the most advanced meeting rooms in the world and a special balcony which can be used as a strategic position for command and control. The vehicle is 16 metres long, 4 metres high and weighs a massive 32 tons, with its own generator and a tank which can hold 900 litres of fuel. The Command Vehicle enables the MDA teams in the field to use the communications networks, satellite and internet networks even in situations when other networks collapse – as can happen in large-scale disaster situations. 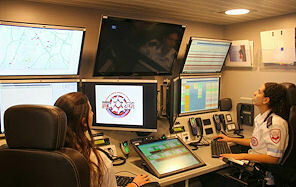 MDA teams worked in the design and construction of the Command Vehicle for four years. The need for such a vehicle became apparent due to the lessons learned following the Carmel Fire disaster during which MDA forces were faced with many challenges, central to which was the difficulty in maintaining continuous communications with each other, and to coordinate activities with other rescue organizations working in the area. This is a special, one-of-a-kind Command Vehicle which does not exist anywhere else in the world.